↑ First, with a few exceptions, the majority of books or articles on Madhyamaka by Western - particularly North American - scholars is based on the explanations of the Gelugpa school of Tibetan Buddhism. 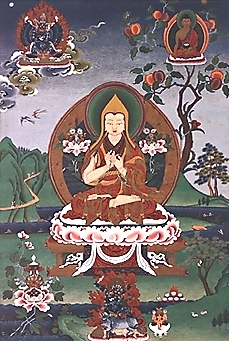 Deliberately or not, many of these Western presentations give the impression that the Gelugpa system is more or less equivalent to Tibetan Buddhism as such and that this school's way of presenting Madhyamaka is the standard or even the only way to explain this system, which has led to the still widely prevailing assumption that this is actually the case. From the perspective of Indian and Tibetan Buddhism in general, nothing could be more wrong. In fact, the peculiar Gelugpa version of Madhaymaka is a minority position in Indo-Tibetan Buddhism, since its uncommon features are neither found in any Indian text nor accepted by any of the other Tibetan schools. ↑ All critics of Tsongkhapa, including the Eighth Karmapa, agree that many features of his Centrism are novelties that are not found in any Indian sources and see this as a major flaw. 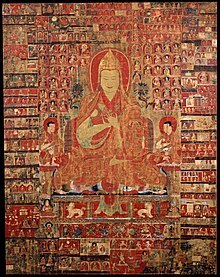 ↑ Though the Sakya had their own teachings on these subjects, Tsongkhapa was coming to realize that he wanted to create something new, not necessarily a school, but at least a new formulation of the Buddhist Path. ↑ As Khedrup and later followers of Tsongkhapa hit back at accusations like these, they defined their own philosophical tradition, and this went a long way to drawing a line in the sand between the Gandenpas and the broader Sakya tradition. ↑ Gorampa, in the Lta ba ngan sel (Eliminating the Erroneous View), accuses Tsongkhapa of being "seized by demons" (bdud kyis zin pa) and in the Lta ba'i shan 'byed (Distinguishing Views) decries him as a "nihilistic Madhyamika" (dbu ma chad lta ba) who is spreading "demonic words" (bdud kyi tshig). ↑ Even as serious a scholar as Go rams pa cannot resist suggesting, for example, that Tsong kha pa's supposed conversations with Manjusri may have been a dialogue with a demon instead. ↑ Tsepon W.D. Shakabpa, Tibet. A Political History. Yale 1967, pp. 85-6. ↑ Laurent Deshayes, Histoire du Tibet. Paris 1997, p. 120. ↑ Brunnholzl, Karl. The Center of the Sunlit Sky. Snow Lion Publications. 2004, pg. 17. ↑ Brunnholzl, Karl. The Center of the Sunlit Sky. Snow Lion Publications. 2004, pg. 555. ↑ Schaik, Sam van. Tibet: A History. Yale University Press 2011, page 103. ↑ Schaik, Sam van. Tibet: A History. Yale University Press 2011, page 109. Apple, James B. Stairway to Nirvāṇa: A Study of the Twenty Saṃghas based on the works of Tsong-kha-pa (State University of New York Press, 2008).